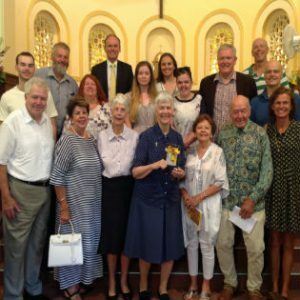 January 25 was a great day of celebration for the Golden Jubilee of Elizabeth Wall, beginning with a Eucharistic Celebration in the chapel of St Vincent’s Care Services, Auburn. As Liz was the youngest of a family of eight, there were many family members who gathered for the celebration, along with Sisters of Charity and staff, also residents and staff of St Vincent’s Care Services. Congregational Leader Clare Nolan’s words of welcome included Liz as a Sister of Love and the uniqueness of her gifts which she has brought to her ministries. 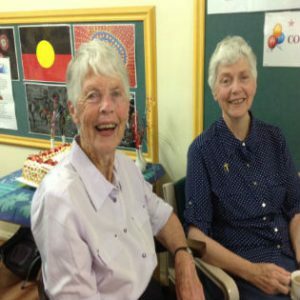 Love and faithfulness, as well as Liz’s motto continued to be the theme at the morning tea as family and sisters told stories of Liz: Her call to religious life quite a while after her sister, Jane Frances entered the Sisters of Charity, and always being available for nieces and nephews amidst her work in ministry. So many spoke of her self-effacement, gentleness, generosity, and welcoming acceptance of people. Health issues have brought Liz back to Auburn where she was part of the hospital community from 1975 to 1983. She is now a valued resident of St Vincent’s Care Services. Main image: Sr Clare, Sr Lizzie (centre), and Sr Lizzie’s brother; Image 2: Sr Lizzie and her sister; Image 3: Sr Lizzie and the family; Image 4, priests on the altar. 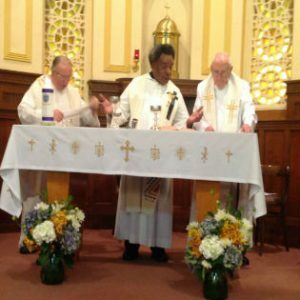 For more images, go to the photo gallery. 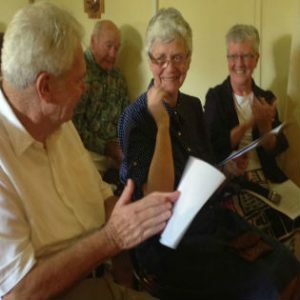 Members of the site will find the Blessing on the 50th anniversary of Sr Lizzie’s profession by the Congregational Leader, Sr Clare Nolan here: Tribute – Sr Elizabeth Wall 50.